Just paste this text directly into the Flowgraph GUI, the nodes should appear. I was just trying out the camera:view nodes. Not exactly sure if/how i'll want to use them, but it seems neat. The graph you pasted didn't work for me. Another FG question: are the particle:set/get attributes nodes functional? I've tried them because I want to change some particle attributes during runtime but can't get them to work. It would be great if you could explain what exactly didn't work for you regarding the graph that was posted. Unless you are not interested in this of course. The Particle flow nodes are AFAIK tied to the GameSDK Legacy particle entities. Since the new particle editor uses schematyc, you cannot modify this from Flowgraph without a custom Flow Node implementation. It seems I got he wrong impression from the Flow Nodes. These are usable. 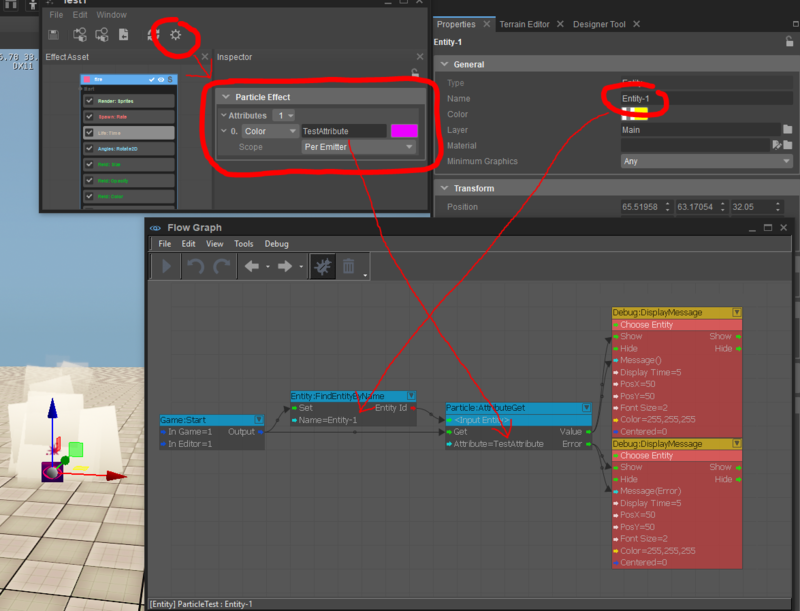 Create a new particle, take note of the entity name when in the scene. Define a particle attribute, in the particle editor click the cog wheel "Show Effect Options". Here you can define your own attributes to be used as values for the various particle effect parameters. For the flow node simply get the entity by name "Entity:FindEntityByName". Create the flow node "Particle:AttributeGet" and set the Attribute field to the attribute name you created. Link the nodes with a trigger. Note: If the attribute does not exist, the Error out port will be triggered. If there is no entity assigned to the flow node, no error will be produced and of course, no value either. Example: Sorry for any confusion caused. It's the disable part that doesn't work for me. In the graph that was given by Cry-Chris, I assign an entity to both camera:view nodes. The view switches as expected on game start but it remains after it's disabled. I assume you are using a template project? The first person template? That's right, I'm using the first person template.